During faceoffs involving this card, you may flip a number of additional cards equal to the number of colors this card has, then choose one of the cards flipped this way and ignore the rest. 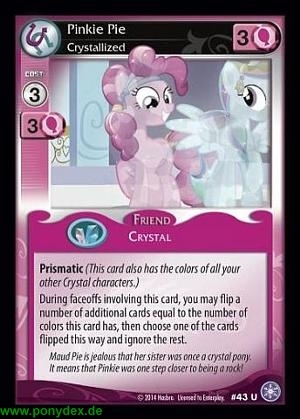 Maud Pie is jealous that her sister was once a crystal pony. It means that Pinkie was one step closer to being a rock!